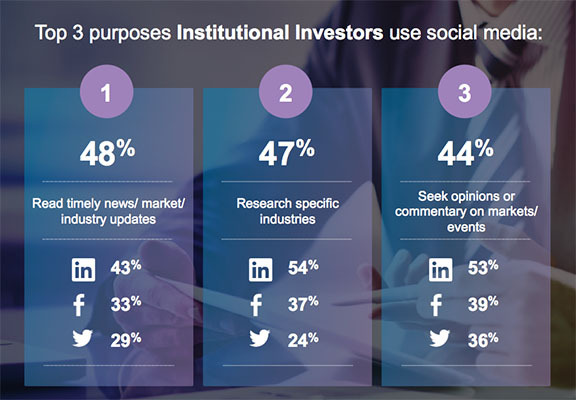 As digital and social media become key sources of investment-related information, Institutional Investors are increasingly turning to social channels, particularly LinkedIn, to inform their investment decisions. That’s what Greenwich Associates found when they surveyed more than 250 Institutional Investors and asset managers in North America, Europe, and Asia. The survey found that nearly all Institutional Investors use digital media sources for professional purposes (97%), and an impressive 79% use social media at work. With its focus on professional content, LinkedIn is the preferred social media source with 48% of all Institutional Investors using the platform. 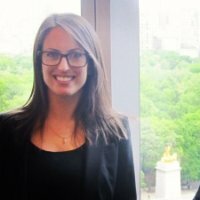 As we all know, social media can be used for a lot of different reasons, but when it comes to Institutional Investors, the top 3 reasons they turn to social media are: reading timely news and market updates, researching specific industries, and seeking opinions or commentary on market events. 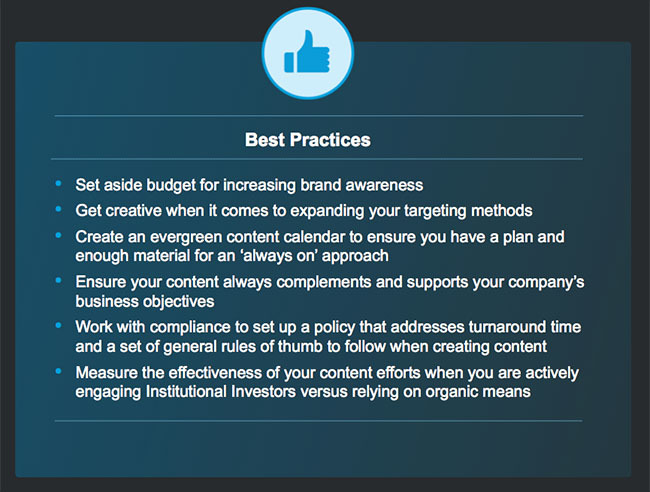 LinkedIn leads all social platforms for these purposes. For content marketers looking to build relationships with their audiences, it’s interesting to note that LinkedIn was also used 4x more than other social networks for deep subject matter education. The bottom line? Investors are actively seeking investment-related information via social media. When they find insightful information, they take action, whether by sharing information, making an investment decision, or deciding to work with a certain firm. Marketers and firms that satisfy this demand can secure and enhance relationships with Institutional Investors, and tap into an enormous opportunity to build their businesses. 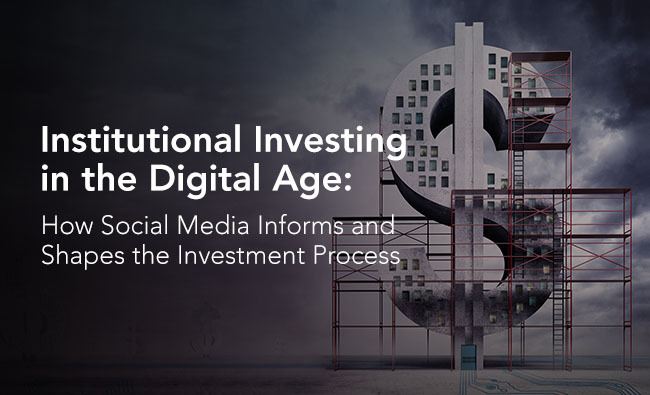 Download our research eBook, Investing in the Digital Age: How Social Media Informs and Shapes the Investment Process for a deeper dive into our global findings. You’ll discover more statistics and trends, along with best-in class opportunities for your brand to influence Institutional Investors on social media.